What a month it’s been so far. I know I’m not the only one who’s feeling it. Each month brings on new challenges, opportunities for growth and changing direction, and I can't help but feel the pull to follow my intuition with two dominant insights from my inner guidance; "It’s ok to simply ‘change your mind", and, "Am I allowing my guidance to lead me? The very same guidance I use in my readings. Am I using it for myself?". It's this guidance which has me questioning if I'm simply changing my mind and listening to my ego or listening to my intuition and souls purpose. More than ever I'm called to share the direction I’m being led in. I’m not attached to the outcome, but I know that I am being led in this direction by my soul while my ‘logic brain’ (as I tend to call it) has been shoved out of the way and had its mouth taped shut, and honestly, that feels really, really good. I’m obsessed with doTerra essential oils for endless reasons but their power goes above and beyond the physical and ‘practical or tangible’ uses. Their spiritual and emotional properties are what really call my name like nothing before, and it's for this reason I am narrowing my focus. While I love teaching about the practical day to day uses of the oils, it’s nothing that you can’t find yourself from other resources. 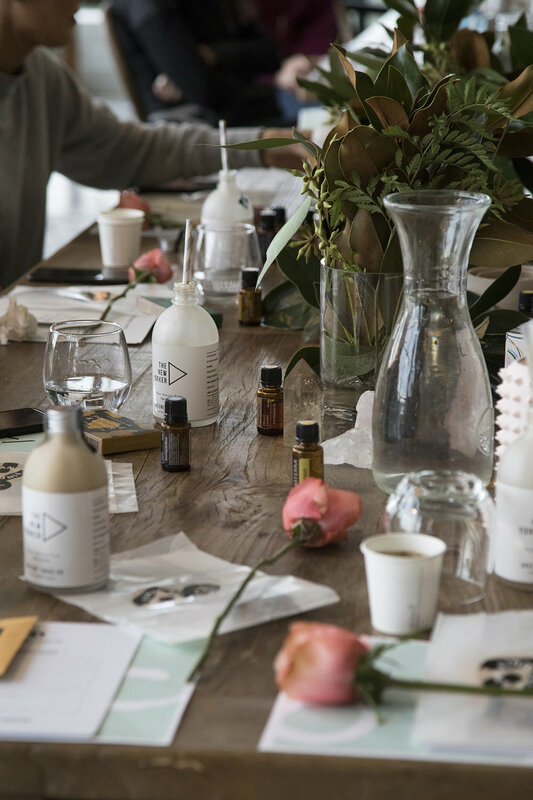 I want to add value to your lives and equip you with the tools and knowledge you need to utilise these potent, pure essential oils to heighten your intuition and go precisely where you are guided. I want to teach you how to go inwards when you want to go outwards; to allow you the space to practice talking to your higher self and asking your logic brain politely to step aside. Then, like a muscle getting stronger and stronger with practice, and over time, it becomes routine. That sweet, sweet routine of closing your eyes, going inwards and channelling the answers you are looking for by yourself. Everything you need to know is already within you, I know you know this. Break free of the conditioning that all our answers are lying outside of ourselves and trust yourself. Right here, right now. How do you feel about empowering yourself to channel intuitively? We all know how important it is to drink water throughout the day regardless of the weather. But sometimes, you simply forget! So here are a few fun ideas as the weather heats up to keep your hydration game strong (and also delicious). Remember, if you are using oils in your water bottle, always drink from glass or stainless steel only. Citrus oils are amongst some of the milder oils in the range and make for delicious additions to plain or sparkling water or your own fruit water mixers. Oils that we like to use regularly to encourage that 2L a day water habit are Lemon, Grapefruit, Lime, Tangerine, Wild Orange + Green Mandarine. Add a drop of your favourite doTerra essential oil to a glass of sparkling water and your go-to sweetener, stevia, xylitol, honey or maple syrup and you’ve made yourself the healthiest ‘fizzy drink’ going around. Or make a mixer using organic frozen fruit as below, these two combinations in particular are always popular with friends - Raspberry + Lemon or Blueberry + Lime. 1. Add frozen fruit to a pitcher along with 1/2 cup of filtered water. 2. Allow to defrost until you are able to squash the berries a bit. 5. Give it a mix and let it sit for half an hour before you top with filtered water and allow to sit either overnight in the fridge or for a few hours before drinking. This quick and easy rhubarb recipe is a winner to top porridge, chia puddings, yoghurt, cakes or anything you can dream of with. Topped this cake mix with the stewed rhubarb before baking. Topped cake after baking with stewed rhubarb. 1. Remove stems from bunch, wash thoroughly and rough chop. 2. Add rhubarb along with all ingredients except the Wild Orange oil and bring to a simmer over low heat. 3. Stir from time to time but allow the rhubarb to soften and come apart. 4. Remove from stove once rhubarb is cooked through and softened to your liking. 5. Once cooled, stir through the essential oil and enjoy. This can be stored in the fridge for a week but is great to top cakes with as well as add to all your favourite breakfasts. Whether you are a full blown alternative health nerd or you are simply curious, as a mother, these are the Top 4 doTerra Essential Oils we feel would best serve an array of common issues that pop up in the everyday lives of a family with children. Below are just a few (there are so many more but we won't overwhelm you straight up) of the simple ways in which this magical Top 4 could make your life so much simpler and introduce the highest quality, plant based + chemical free alternatives into your household. + As the name suggests, may aide with relief of a blocked nose, any sinus or breathing issues. + Can be used for burns, sleep issues, calming, relaxation, to relieve cuts/bites/scratches and earache complaints. + Can be used for colds, flu, viruses, teething. We definitely recommend using as a preventative measure when sickness is going around amongst other children or family members. + Can be used to help relieve fevers. If you'd like any more information make sure you contact us here or if you'd like to have access to our ongoing support and also access wholesale pricing (the same prices we pay) then head here to purchase your essential oils. * We always recommend starting with roll ons as they are pre-diluted which means they are best to use when first starting to use essential oils on your children. If you're a hayfever/allergy sufferer, this needs no explanation. Here in Melbourne, Spring has begun. Queue sneezing, runny/blocked noses, itchy eyes, scratchy throat and laboured breathing whilst you try to get your beauty sleep in. In the past, (I'm talking over 5 years ago now), I had tried everything available to humans over the counter and off the shelves. Nothing worked for me, not even the double strength, prescription only, blah blah amazing wonder pill. Just nothing. No results. No symptom relief. For anyone who experiences hayfever, you know what I'm talking about.